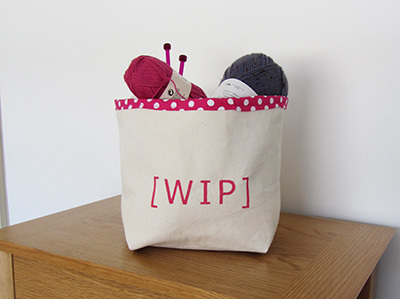 To conclude my series on knitting and crochet supplies organisation, I want to share with you some good ideas a came across. It takes scrap of fabric and some wide elastic to hold your DPNs and your work in progress together. For this one I link to Pinterest because I was not able to trace a blog for the initial source of this so good idea. I am definitely making this. A shoe box, some spare cardboard and four holes, that’s all it took Ansie to prevent her four colours of yarn from tangling. Thanks to Jill‘s left over curtain fabric as it allowed her to make this lovely needles organiser that she hangs on the wall or can roll up when on the go. The elastic for dpns is genious!